It will be followed on September 19th 2018 by the launch of the EU PropTech House. 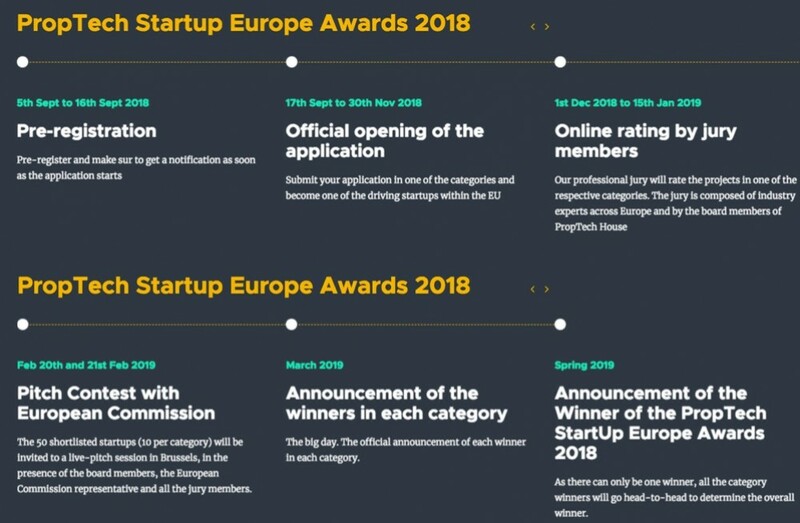 The Proptech StartUp Europe Awards is a brand new category within the StartUp Europe Awards’ framework (22 categories), promoted by the European Commission and implemented by Finnova Foundation, which presents a prize methodology for startups at local, regional and national level, fostering the open innovation and the collaboration between the different actors of the European ecosystems, through the private-public partnership supporting new entrepreneurs. At the same time it creates a network of contacts that will provide visibility to all the local startups who, by using this network, will be able to scale their services and products at a European and even global level. On its behalf, Finnova is an European foundation based in Belgium, Romania, Panama, Chile and Mexico devoted to the promotion of start-ups and innovative initiatives for the collaboration between public and private entities relying on the tools offered by the European Union. The PropTech StartUp Europe Awards 2018 will have 5 subcategories: Invest, Market, Design & Build, Manage & Operate, Live & Work. As there can only be one winner, all the subcategory winners will go head-to-head to determine the overall winner. Idriss Goossens (founding board member EU PropTech House): "That is why we launch the EU Proptech House initiative on September 19th 2018. Its first goals are promoting contacts with the EU Commission and the European Innovation Council, scale up cross-border collaboration and facilitate access to EU Funding." Dirk Paelinck (Workero): *“The launch of the first PropTech Startup Europe Awards is clearly a sign of recognition by the European Commission of the importance and the huge potential of the innovative PropTech industry reshaping traditional real estate. Workero has obtained the Seal of Excellence of the European Commission and accepted recently in the comprehensive Horizon 2020 Program, SME Instrument for funding by the European Commission, we know how important it is to be recognised and to get support. All European PropTech startups are invited to submit their case between September 17th and November 30th on the website of EU PropTech House ([http://www.proptechhouse.eu]) Our professional jury will rate the projects in every respective category. The jury is composed of industry experts from across Europe and of the board members of Proptech House. Judging procedures will run until Jan 15th 2019. The 50 shortlisted startups (10 per category) will be invited to a live-pitch session on February 20th and 21st 2019 in Brussels, in the presence of the board members, the Representative of the European Commissioner and all the jury members. The ceremony for the Awards will be held in Q2 2019 in the presence of representative of the European Commission. The organisation of the PropTech StartUp Europe Awards will be handled by Finnova Foundation, Workero and the brand new EU PropTech House. The mission of the EU PropTech House is to support a sustainable European PropTech market and to create a positive impact on the European living environment and beyond. The objectives will be to facilitate access to EU Funding, scale-up cross-border collaborations, to standardize and uniformize the European PropTech markets, and to create a legal framework adapted to the PropTech, and fostering innovations in Real Estate. 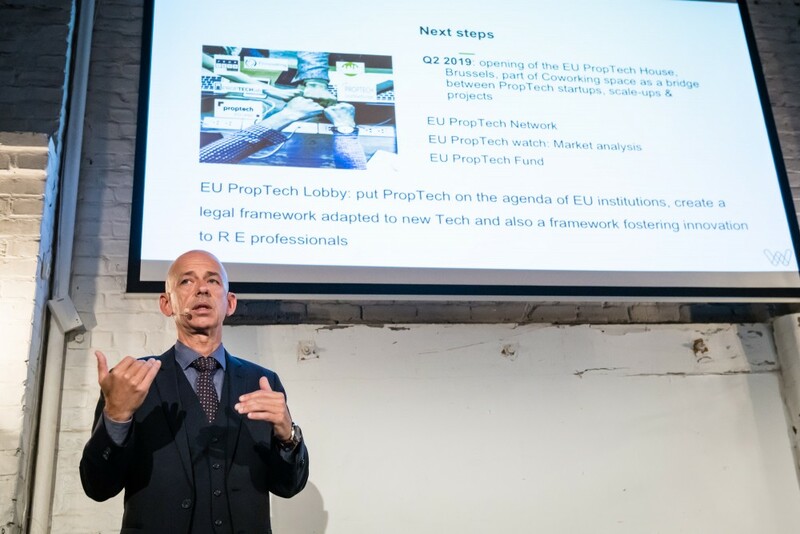 The EU PropTech House enjoys the support of partners such as Finnova (Professor Manuel Revuelta), Workero (Dirk Paelinck) and the national or area PropTech associations in Europe, together with an advisory board headed by Idriss Goossens, founding board member and composed of PropTech Poland, PropTech NL, PropTech South East Europe, Finnovating (Spain) and PropTech Lab (Belgium), while 7 other national PropTech associations are in the process of onboarding now.